The Komax Ice Cube Tray come with a silicone lid that seals the water into the trays and prevents spillage as you go from water to freezer, this is such a simple solution to a problem I have had with ice-cube trays since the beginning of time. Not to mention the lid also keeps the ice from absorbing any odors from your freezer. I found the handles to be very slip resistant and I was able to get a firm grip on the tray. It is rather neat because you can make ice cubes that are more diamond-shaped, simply angle the covered tray while they are freezing. Once your trays are frozen you can easily store them vertically, which makes them a great space saver. 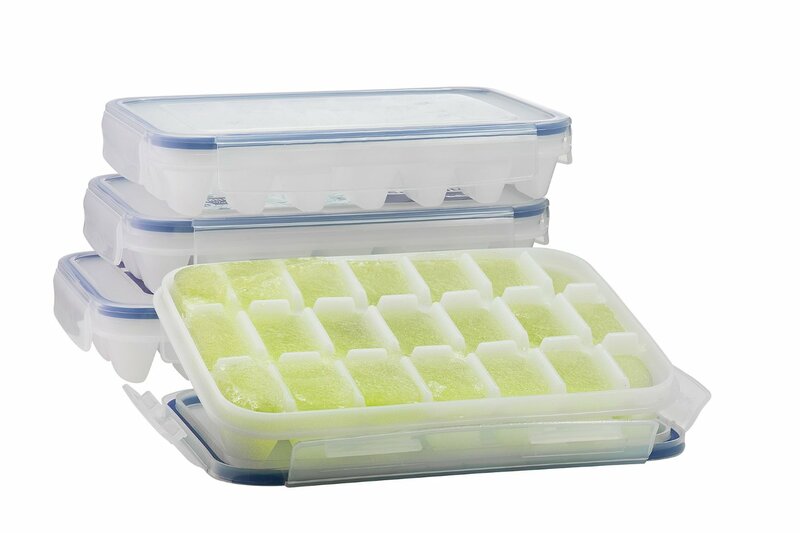 Each tray makes 21 ice cubes and come in a four pack. They are a bit smaller and fit easily inside of our sipper cups. You can purchase these on Amazon at the link below! Komax Ice Cube Tray truly are the best ice-cube trays I have used. Everything you could possibly want the Komax Baby Food Storage Containers, I think has it. It has locking lids so no accidental spills which every mom needs! 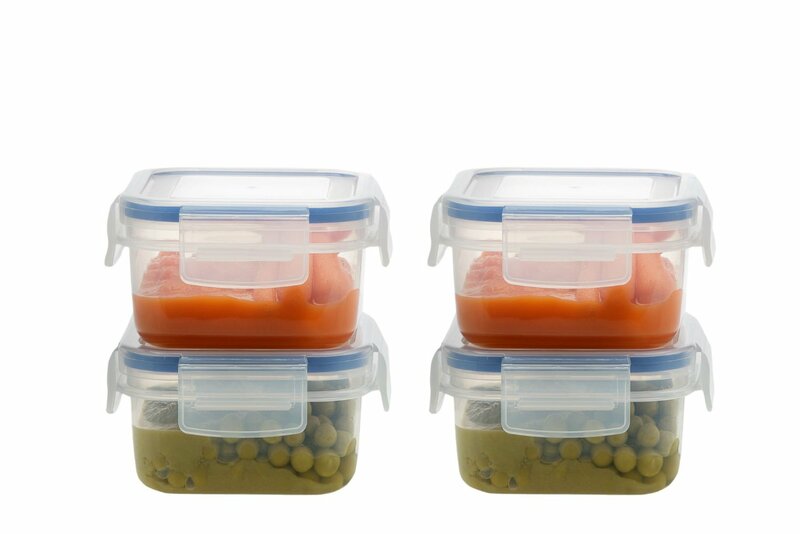 They are Microwave, Dishwasher, Fridge and Freezer safe, whether you make your own baby food or use jars, when you have left overs these containers keep them air tight and fresh, not like the jars that collect in your fridge and not seal well. Komax Baby Food Storage Containers are also 100 % leak proof, so if they happen to be in your diaper bag or fall out of the fridge they will not get all over everything. 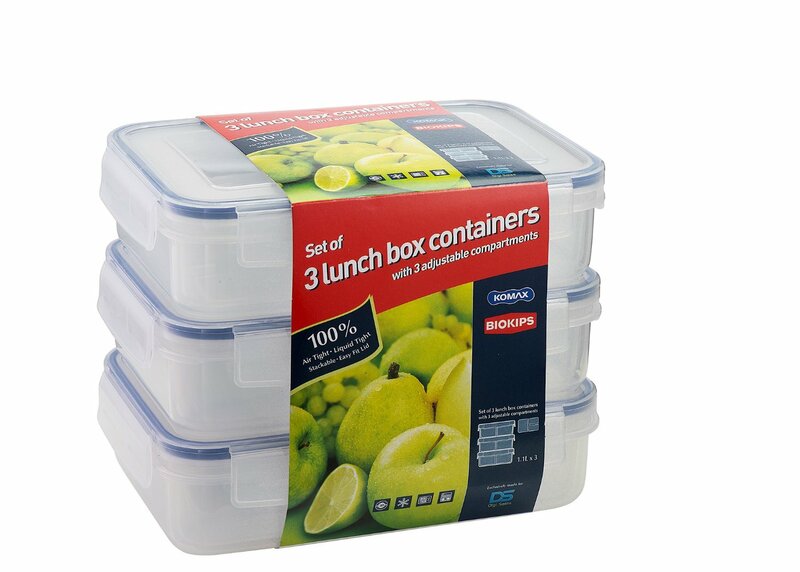 Now the product I loved the most was their Komax Lunch Boxes . These come with the same lock tight sides, they are easy open for kids, and keep things fresh and seal with a silicone seal. 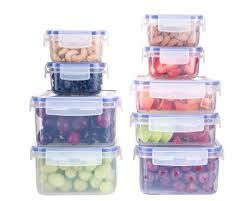 You can move the positions of the compartments to tailor make the container to different meals for different people. 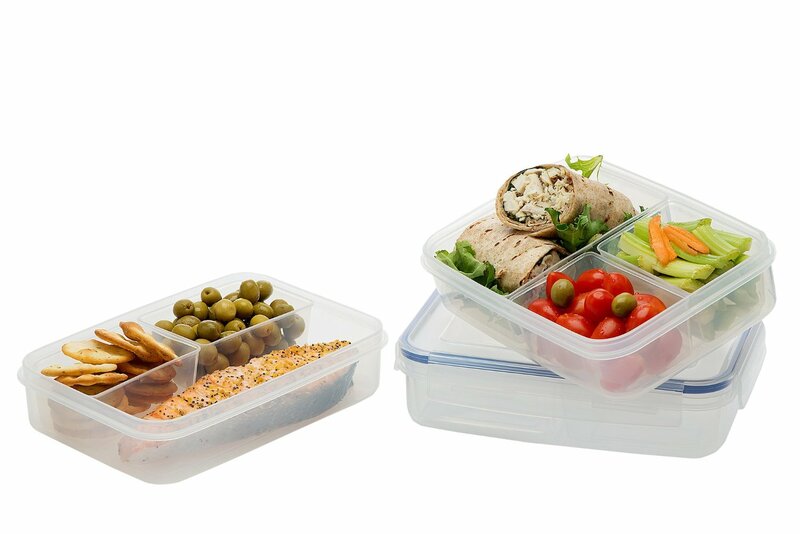 Komax Lunch Boxes are FDA approved, and BPA Free, safe for microwave, freezer and dishwasher. They really could not be easier to use and keep clean, they come in a three pack and are easy to store and use for left overs. One of the features that I like the most about this, is that you can put all of your containers inside the storage box and seal them up, when its time to eat it, you can take just the one container out that needs to be heated out and heat it up. No more warm salad or desserts. The versatility of the Komax Lunch Boxes are just amazing. Overall, all of the Komax Storage Containers I tried, I liked. They seal well, they are strong and BPA free, they are all able to go into the dishwasher for easily clean up. Heating up in the microwave is never a problem, there is no need to transfer them to different plates, you can simply heat up and eat all in the same container. It is really a versatile and sturdy product that I am sure I will be using often.